On January 20, 2012 the United States Department of Health and Human Services (HHS), under Secretary Kathleen Sebelius, unveiled a new policy which has come to be known at the “HHS Mandate.” The new Mandate would requiring nearly all private health insurance plans to include coverage for all FDA-approved prescription contraceptive drugs and devices, surgical sterilizations and abortion-inducing drugs—drugs that interfere with implantation in the womb and therefore destroy the life of a human being in the earliest stage of development. This Mandate is the result of Affordable Care Act, commonly known as “Obamacare,” passed in 2010. In September of that year the federal government announced a general list of “preventive services,” but asked the Institute of Medicine (IOM) to recommend a list of “preventive services for women.” Religious groups urged the IOM to not include sterilization and contraceptive services in the Mandate. Undeterred, in July 2011 the IOM made recommendations that included the two services, and the government adopted them in August of 2011. Referring the details of these “preventive” services to the IOM was apparently intended to provide an appearance of scientific objectivity to the enactment of the HHS Mandate. However, Research conducted by Human Life International has revealed that every member of the IOM committee heavily biased in favor of legalized abortion—some with direct ties to abortion advocacy groups. Not a single member was pro-life, much less had any qualms about contraception and sterilization. All health plans will have to cover these “preventive services” without co-pays or other cost sharing—regardless of whether the insurer, the employer or other plan sponsor or even the woman herself objects to such coverage. The HHS Mandate provides an exemption for “religious employers” who may object to contraception, sterilizations and abortion-inducing drugs, but this exemption is so narrow that it fails to cover the vast majority of faith-based organizations, including Catholic hospitals, universities, and service organizations that help millions every year. Religious employers are exempt only if their purpose is to inculcate religious doctrine, they hire and serve exclusively people of their own faith, and they qualify as a church or religious order according to a very narrow definition in the tax code. Most religious institutions providing health, educational or charitable services to others have no protection. Not even Jesus and the apostles would have qualified for this exemption. HHS claims this exemption is like those enacted by most states that have a contraceptive coverage Mandate, but that is false. This Mandate is unprecedented in federal law, and broader than any state contraception mandate to date. Never has federal law required private health plans to cover sterilization or contraception, including abortion-inducing drugs. And, as compared to state mandates, the HHS Mandate is the most expansive ever enacted. At least 22 states have no contraception mandate at all. Of the 28 states that have some mandate, none require contraception coverage in self-insured and ERISA plans*, only two states include contraception in plans that have no prescription drug coverage, and only one state specifies sterilization. On February 10, 2012, responding to intense opposition from a broad spectrum of religious institutions all over the country, including all 181 Catholic bishops presiding over diocese, President Obama announced there would be an “accommodation” for religious institutions opposed to facilitating practices contrary to their moral teachings through their employee health plans. In the so-called accommodation, insurance companies—not the religious employers themselves—would be forced to pay for the abortion-inducing drugs, sterilization, and contraception. However, since any funds the insurance companies would use to make such payments ultimately come from the premiums paid by employers, Obama’s “accommodation” is nothing more than a kind of economic shell-game. In addition, it provides not even this inadequate accounting trick for self-insured religious institutions, which number in the hundreds if not thousands. In the final analysis, the so-called “accommodation” still forces religious institutions to provide employees with health plans covering free “services” that violate their religious convictions—or face crippling fines should they refuse. Moreover — despite their rhetoric about making an “accommodation” — the Obama Administration actually finalized the original HHS mandate as originally drafted, leaving intact all of its provisions and making no changes to the exemption, the narrowest protection for conscience known in federal or state law. It turns out that the implementation of the “accommodation” will be left until 2013 — long after the federal elections in November. President Obama’s HHS Mandate violates freedom of conscience, a right that is guaranteed by the First Amendment and even several federal laws. 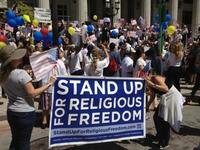 The right to practice one’s religious beliefs is protected by The Bill of Rights. The Obama administration’s attempt to force all Americans to buy coverage for sterilization and contraceptives, including drugs that induce abortion, is a radical incursion into freedom of conscience. Never before in U.S. history has the federal government forced citizens to directly purchase a product in contradiction to their moral and religious beliefs. Citizens across the country are rising up in response to this unprecedented attack on religious liberty, freedom of conscience and the sanctity of life. 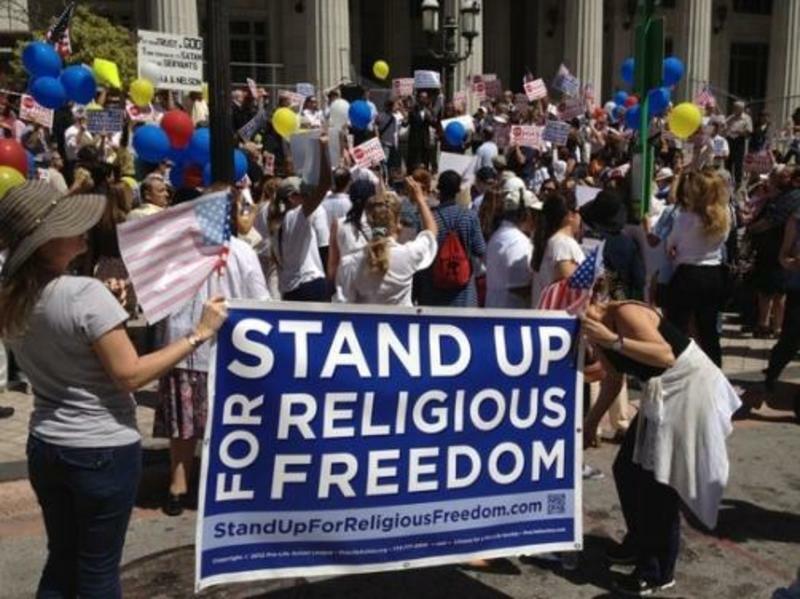 The first major step in their opposition to the HHS Mandate and bold defense of religious freedom is the Rally for Religious Freedom, being held March 23, 2012 at noon local time in over 100 cities from coast to coast. The Rally for Religious Freedom — popularly known as the “Stand Up Rally” will launch an ongoing, grassroots effort to stand in solidarity with the American Catholic bishops and other religious leaders denouncing the HHS Mandate, educate the general public about what’s truly at stake in this controversy, and demand that Congress reverse this assault on our cherished freedoms — or effect that reversal through the democratic process.